The Sea facing carter road is an awesome place to visit in bandra. This is a celebrity road and road of Mumbai for famous churches like Mother Merry (Mount Merry) and Father Agnel.Carter Road ends at the lavish 5 star Hotel Taj and the Lovers Point (BandStand) rocky hill area from where you can see the huge Bandra Worli Sea link. 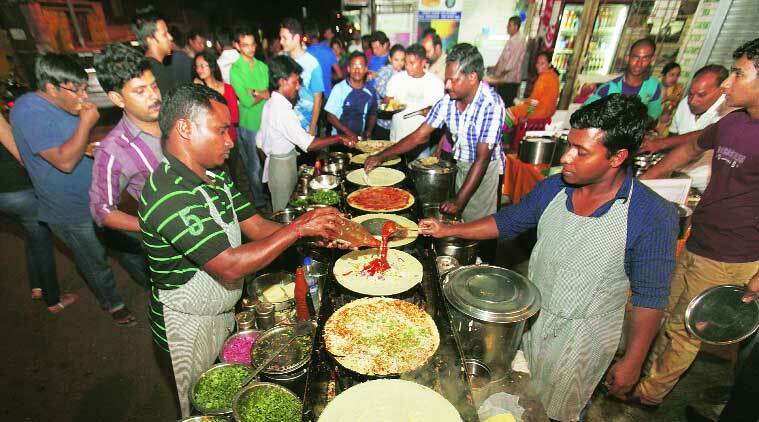 he Carter Road Khau Galli near the Bandra promenade offers more than just great food. Packed with famous street food joints and small eateries that serve up an explosion of flavours and textures, this Galli’s star attraction is the ubiquitous shawarma. The stalls also offer a wide range of other culinary delights, such as momos, falafels, wok-fried Chinese preparations, and spicy, lime sprinkled corn on a cob. Don’t forget to dig into scoops of frozen yogurts, sweet cupcakes or freshly made waffles for dessert. Popular with college students and office goers, this lane near Marine Lines is best for those late working hours. Manchurian rice, alu baby corn chaat, pav bhaji, cheese paneer frankie, and the Bombay sandwich are popular here. If you fancy a non-veg meal, cross over to the Cross Maidan for some delicious chicken curry with hot rotis. Or, if you need a quick fix, grab a butter pav and bhajiyas with a milkshake and you are good to go! Perhaps the city’s most famous khau galli, Mohammed Ali Road dishes out delicious kebabs, biryanis and sweets all year round. It becomes even more enticing during Ramzan, when the street stall vendors host millions of customers craving Ramzan-specific dishes. A Khau Galli in the heart of Mumbai, the Tardeo eat street, caters to office goers trying to catch a quick lunch. One can easily get a proper meal at Tardeo, be it vegetarian or non-vegetarian, with something to cater to every taste – from puri bhaji and South Indian lunch thali to shawarmas and mutton biryanis. Mahim Khau Galli is a legendary street food destination among Mumbaikars and tourists alike, especially for its mouth watering non-vegetarian fare. Once known as Balamia Road, Mahim Khau Galli is lined with stalls selling yummy eats like baida roti, khiri, sheekh, khichda ( a heavenly concoction of meat, lentils, rice and spice) and melt-in-the-mouth chicken tandoori. Don’t miss the mix ice-cream falooda and the dry kulfi falooda at Baba Falooda, the most famous falooda place of Mahim. While Chembur Khau Galli isn’t always the easiest place to reach from other parts of Mumbai, it’s worth visiting over the weekend for a little slice of foodie heaven; it has speciality Sindhi and Punjabi eateries. 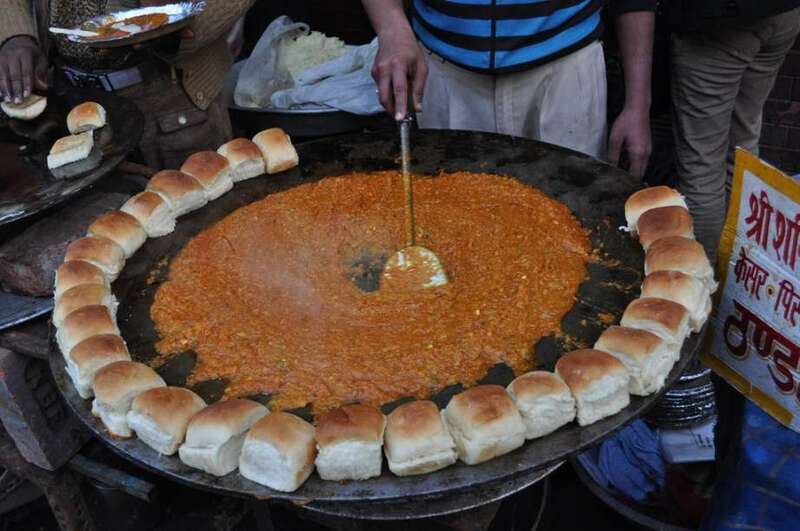 Unlike most Khau Gallis in Mumbai that offer staples like Pav Bhaji, Vada Pav and various kinds of dosas; the unpretentious, hole-in-the-wall eateries here concentrate purely on regional specialities such as koki, kulchas, dal pakwas, and ragda pattice, along with an array of sweets.